Every day I’m told I’m stupid. Repeatedly. It can be exhausting and difficult to handle, but I’m sure it’s for my own good. Governments practically scream how stupid I am from the rooftops. Apparently lying about everything and making rich people richer is more important that taking care of all the citizens, more important than eradicating poverty, feeding the hungry, affordable housing, good jobs, education, healthcare, ending wars and conflict, or treating people with dignity and respect. If I don’t agree, that’s because I’m stupid, I don’t understand their brilliant plan, which seems more like an overly elaborate Scooby-Doo plan that never turns out properly and if it does, it’s quite by mistake. I don’t understand why so much money is spent on politicians, their cronies and bagmen; on ads promoting themselves; red tape, then again, what do I know, I’m a delicate flower, I do declare without all these rich men telling me what’s right I doubt I could put on my own shoes in the morning. Thank goodness I now understand how stupid I am. 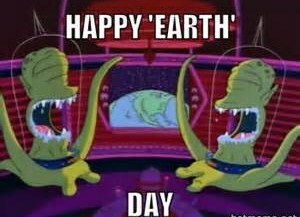 Today is Earth Day, why does anyone even bother? I used to think it was important to try and save the planet, but luckily I now understand how stupid I was. Turns out climate change isn’t real and even if it is, it’s not that bad. I should stop whining about the environment. I should understand that all this extreme weather is simply an opportunity to rebuild cities, towns, and homes over and over again when they get destroyed by weather events. I stupidly used to think oil was bad for the planet too, but now I’ve been enlightened and feel much better. I even thought fracking was bad just because it wastes a massive amount of clean water, causes earthquakes, contaminates groundwater and air, etc. 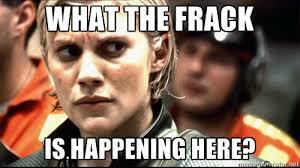 I should have understood that fracking is a fun way to invade the Earth on a fundamental level that causes it to shake, rattle, and roll. I’m so out of it, I used to think when I read product reviews they were real. Duh, no, most are not even done by real people. Many were written by computers programmed to make spelling mistakes and grammatical errors, to appear as though they were done by real people not corporations (but aren’t corporations people?). Isn’t that clever? I’m being lied to by everyone, all day, every day…even my memory lies to me, probably because it knows I’m too stupid to know any better. I was so stupid when the Occupy Movement started, I thought they were protesting the corruption of democracy, and how the banks and corporations control our governments and every aspect of our lives. Luckily the news, who would know because they’re run by those same corporations, told me it was a poorly organized joke. Whew, what a relief, I thought this movement might actually challenge the corrupt system and bring about positive changes. Thankfully the news and the government keep explaining to us, I’m sure because they love us, that anyone who doesn’t agree with them are: radicals, flakes, terrorists, idiots, kooks, hippies, felons, drug users, and uneducated trouble-makers. I hope they keep explaining it because what if people actually start to believe they don’t have to live in a society run by the rich who only care about the rich? What if we actually believed we should expect our leaders to do what’s right for all of us? Thank goodness I have people to set me straight, to tell me how stupid I am for believing we can have a good economy and a good environment, or believing that we are worthy of an equal, kind, and fair society, that we are worthy of the truth. I’m sure someday I’ll look back at this and laugh, if I can understand it. I feel you. I’ve gotten condescend looks too, if I ever dream aloud about a better place to live. What do I know after all! Great post. I too am constantly reminded how stupid I am. Embrace it! Perhaps being stupid is not such a bad thing. Maybe believing in impossible things serves a purpose in the world. Sometimes people can be just too smart for their own good. The White Queen (Through The Looking Glass) says that in her youth she could “believe six impossible things before breakfast” and counsels Alice to practice the same skill. Sage advice that, as well as being a brilliant career move in today’s reality. But the Earth shouldn’t have to suffer while we crawl around on her trashing and abusing her. You are so very correct! We need more people (way more) who feel as you do. Where do we find them, especially before elections? Yet they still believe, no matter how often certain candidates lie, steal, and cheat they vote for them anyway. Great post!!! Feeling a bit facetious? I agree completely. Maybe they are the stupid ones for believing we believe all their drivel. As Scooby says Ruh-Roh! Enough people believe the drivel to get them elected and sometimes re-elected. Ruh-Roh! I’m very upset that you disparaged Scooby and the gang by equating their plans with the government. I think you owe Scooby an apology. Beautifully-made point. I’m equally stupid. Donna- you echo my thoughts today. So much. I’m at a complete loss as to what to do about this government situation. I have written letters/sent tweets/emails to everyone I can think about C-51 (and some other stuff) and received nothing in response to my concerns. Isn’t it interesting that the media isn’t talking much about that particular situation? Or the fact that the brand new budget intends to throw excessive money at the Isis ‘issue’? So glad, indeed, that we have Harper’s Cons to tell us just how stupid we are. Sure, because most of us have an extra $10,000 every year to put into savings, don’t we? The tax breaks are for the rich and only for families, heaven forbid if you’re single in Canada these days. But it’s always the same, they make promises, lie, put money into one pocket and take it out of the other all while cutting services. 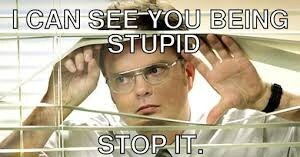 If you’re stupid, then I’m a complete idiot. Seems like the stupid gene hits as many men as women and has even crossed the oceans because believe me, I feel pretty stupid too. I asked a politician to vote a certain way on something and he assured me he would because he believes in it. Did he vote for it? Nah, It seems his party used a whip and told him not too. It involved constituents being able to sack politicians they didn’t think were doing their job. It appears I’m silly for thinking he’s there to do what we want him to. I feel so silly right now, just before an election too but I bet the lying b*****d gets back in. I think that’s a wonderful idea and I think politicians should be penalized for lying, breaking promises and yes, fired if they don’t do their jobs. I don’t know too many politicians that would vote for that, sadly. Oh they all just keep getting in. Scary. Massive hugs David and I hope this day is good to you…how’s the leg, any better? Great post! You are spot on! I wish I could laugh at this because it’s stupid. Unfortunately it’s not stupid nor funny. Just very, very sad. Hope this week is going well, Teagen, all things considered. Great post! We need to keep speaking up! I thought it was just me. At least we are in good company, right? Ah, yes – it’s the beginning of the “we say it, it’s the truth, even if we’ll say something entirely the opposite tomorrow. Today it’s the truth.” I’m not so sure they’re trying to convince us we’re stupid – just beings with extremely short term memories! Great post. Each time I open up and read the newspaper, I slam my head on the table. How stupid of me to think all is not right with the world. I’m just a worry wart and should making waves in the big pond of the powers that be. Can never give up hope. Might as well pack it in if you give up hope. Great Rant! You captured my thoughts exactly. I also appear to be terribly stupid. Thank goodness I have politicians and corporations to keep me informed. I’m in your club of stupids! Your point is well-made Donna. Hooray for all of us plain old dumbasses, Donna. Bravo, brilliant one. Sadly here in Canada our politicians are always in election mode, nothing is done to actually help or fix anything, it’s all about their bases, raising money, getting elected, and staying in power. Campaign spending is ridiculous especially since the internet makes reaching people much less expensive than television ads. If a politician can’t run a modestly priced, well thought out, positive campaign, why should anyone think that politician will spend the public’s money responsibly or do a good job running the country? It’s true, then again, the have to spend tons on robocalling everyone. Sigh. Awesome! I’m two days behind on this one, but Happy (belated) Earth Day! This just makes me want to say….Bah! And drown myself in a GOT episode. You’re quite right… I just wish you weren’t. I like all the memes in this piece! Great post. You have a really funny blog! Each time I come, there is something so funny here. 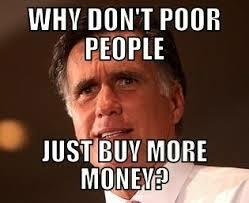 Today is it was the quote on Mitt Romney–why don’t they just buy more money? Hysterical. Thanks for visiting my site this weekend. Nice to see you. If we were only more intelligent, like old white men, we could fix it all. Maybe some day. I love to see logic in practice. Thanks Donna. What I’d really like is a politician who believes in telling the truth even if the truth shoots him or her down. That’s stupid as it is impossible that any politician would but what’s wrong with dreaming? Turn off the news, do your own research, hold your own opinions and be open-mind to the opinions of others. I think if we all stopped believing things on face value without peaking behind the curtain it would go a long way to better understanding. When I was a journalist it was a rule that any sources needed to be verified in 3 places before it could be printed. Now opinions are printed as facts with little to no verification. And opposing views are shut down if they are out of step with popular opinion. Yes, much of what we are told now is a slant or skew of opinion not fact. If we don’t buy into it or question the validity we are name called and told we are stupid or “misinformed.” It is the truly stupid that do not question.